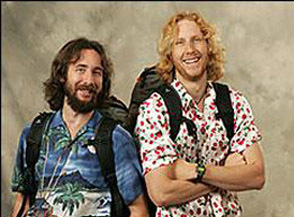 Now down to five teams in the Amazing Race, we leave Greece just as Eric & Jeremy were beginning to have an eye-opening insight into what it meant to ‘go Greek'. Ah well, it'll just have to wait until the after party. These two are in fact first out of the gate in this leg (for an incredible fifth time) after grabbing the fast forward in the last leg, leaving at 11:54 p.m. The first destination of the day is Muscat, Oman, on the Arabian Peninsula. Once in the city, they have to find a giant incense burner (Advantage: Hippies) to find their next clue. Eric & Jeremy (slogan of the day: We work harder. Stop laughing) cross the nearby bridge and book themselves onto a charter bus. Joseph & Monica are a full four and a half hours behind in second place, not that it matters much with a very quick bunching point right ahead. They lament their bad luck so far, deciding that they need to go it alone. Which means effectively Joseph going it alone, for all the help Monica provides. Fran (with her enormous hump) & Barry are fourth out, at 6:20 a.m., and have set themselves the goal of moving up one whole spot. They get on the 9 a.m. charter with the previous three teams, at least ensuring they won't fall behind for the time being. BJ & Tyler head out at 8:51 a.m., making the likelihood of their making the first charter bus small. They're in much higher spirits, however, having gotten their call from the governor. They get stuck on a bus an hour behind, with far too much schadenfreude from the four teams on the bus already. Did they bogart all the weed at the Pit Stop or something? We cut back to BJ & Tyler, alone on their charter bus... or perhaps not, as they introduce us to their friends, the ghosts of racers past. BJ gives us a dead-on Lake impression, and then lay into Dave & Lori's cuddlebunnyness and the "pink girls's" bubblehead personas. This is very un-Dude like, guys. Of course, the other teams are just outright dicks to them in line, playing dumb (okay, in Eric & Jeremy's case, "playing" may be too strong a word). They show them up by finding out their arrival time, although when they're told the flight is quite full, they take their chances at another connection that's about an hour later in arriving. Everyone is suitably impressed with Muscat on arrival, commenting on the apparent gobs of wealth and beauty around them. Monica, as per usual, misses the point in her own unique way, mistaking a mosque for a palace, thinking that rich people in the United States couldn't be this rich. Be thankful they're not going to the Taj Mahal this year. Eric & Jeremy find the park that contains the incense burners, but see that it's not going to open until 6 that morning. With BJ & Tyler just landing and finding a guide, this has become yet another day where the task is "don't die". With all five teams now waiting and with some downtime available, Yolanda decides to review the day's events, asking Ray if he thinks it's all right to yell at her like he did this morning and give her the finger. Unfortunately, Ray is stuck in defensive mode when just about anyone can see that simply apologizing would dig him out of the hole he's in and end this conversation now, cheaply. Instead he continues to think it's actually about who is right or wrong, and gets put in an effective "time out". That's male-female argument styles in a nutshell right there. The moral of the story really is, don't work out your relationship issues on a reality game show. The next morning it's a scramble up a large flight of steps to get to the clue box, which directs them to go to the town of Sur, and find a ferry crossing there. BJ & Tyler pull out a new trick from their bag, letting Joseph & Monica ask for directions, watch closely and then speed off ahead. It's more deviousness than previously thought possible for these two, and we'll see how well it serves them. Several of the teams get a little confused with their directions, giving an early edge to BJ & Tyler (managing quite well without any funds, I must say). The trip starts to look a bit sketchy, however, turning into a dirt road that is literally flooded over. Incredibly, this is the route they're meant to travel, although there are guides to take them across. While BJ & Tyler are dutifully impressed by the agility and strength of their (admittedly, tiny) guide, Monica shows her cultural sensitivity classes didn't all go to waste by "wanting to bring him home in my pocket". The first four teams are across, leaving just Ray & Yolanda back in Muscat, where they are having their typical trouble in finding directions. BJ & Tyler have come across another river crossing up the path, this time without a guide. They're ready to wuss out and let another team test it out first, but just succeed in creating a traffic jam. Eric & Jeremy prove they don't know the difference between bravery and stupidity by charging past the teams, taking a momentary lead. Tyler, while crossing the muddy stream, calls out, "is this not the most awesome chocolate surprise you've ever had?" I'm reasonably sure that's some kind of euphemism. Monica complains about Eric & Jeremy's maneuver to get in front – "they just want to be in front so bad," well yes, that's the point, is it not? Besides, it's not The Amazing Wait In Line. The teams now reach the town of Sur, find the ferry terminal and get their clues. It's the Detour, a choice between loading a camel into a truck with a winch, and searching a series of watchtowers for a message box. It's needle in a haystack time again! Eric & Jeremy have somehow fallen behind the pack to fourth, with the other three teams ahead of them choosing to go look in the towers. Eric & Jeremy, finally finding an opponent on their intellectual level, choose to wrestle with the camel. BJ & Tyler and Fran & Barry find message boxes quickly after scrambling up a rocky incline, while Joseph & Monica are not lucky with their choice. The towers are actually quite far away from each other and these two admit defeat right away. You could mock them for their pathetic-ness except they at least didn't waste a ton of time. The camels, for their part, doesn't seem altogether thrilled by this process, and groan at both Eric & Jeremy and Joseph & Monica, though after a ton of winching Eric & Jeremy are finally finished and drive off to find the Bedouin with their clue. However, The watchtower task was definitely faster if you had any stamina at all for it, as Fran & Barry find the silver shop where they get their clue quickly, and jump out into a lead. They have to travel to Al Hawiyah (Oh, I'm OK, how about you?). They wait for BJ & Tyler and they travel in tandem. Navigating in the desert proves to be somewhat of a challenge (the lack of landmarks can't be fun) and Eric & Jeremy appear to be totally lost. This is hammered home by the fact that Joseph & Monica, who were behind them, have reached the Bedouin camp, and receive their clue while Eric & Jeremy are out playing Lawrence of Arabia. Amazingly, they stumble onto the camp, and have fallen to fourth. This has allowed Ray & Yolanda to catch up, who finally arrive at the Detour as Eric & Jeremy are leaving. Fran & Barry and BJ & Tyler have no reached the next location, picking up the Roadblock. They have to dig through 117 mounds of sand to find a buried bag of cooked lamb. Let's hear it for more needles in haystacks! BJ and Barry take the task for their teams and get to work under the blazing sun. Joseph & Monica arrive shortly after, where Joseph pulls rank as a man and gets her to do the Roadblock, sensing this isn't going to be one of the fun ones. Eric goes out to dig for his team, and now it's down to who does the best impression of a dog without dying of dehydration. Monica wins the sand lotto, shortly followed by Barry, although he has some trouble bringing it up to the surface. This leads to Fran's typical "motivation by beration" technique coming out to play. I can only imagine the number of times a day that she insinuates that Barry just isn't enough of a man. The clue given to Monica is the final one of the day, leading them to Jabreen Castle, 150 miles away. It's probably good for Barry's sake that this is the last one, as he looks completely sapped and broken down. It's why almost no old teams ever make it to the final four.